The secure messaging feature is for therapists and clients to communicate in a secure and HIPAA-compliant way. For details on how the feature works, please watch videoas well as scan the headings below. To see the Secure Messaging Inbox, an administrator must turn on secure messaging first on the Client Portal page. 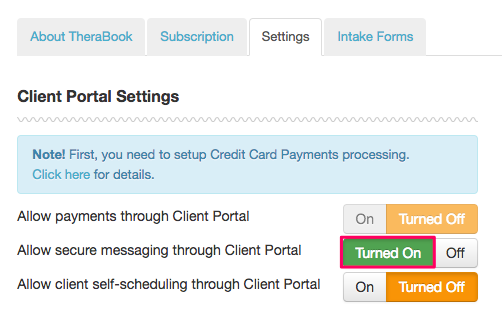 Go to Organization > Client Portal > Settings. Each staff member who wants to use the feature must be marked as Available in the portal. You can view and access messages at anytime by clicking Inbox from in the top navigation menu. A message with multiple message threads is a conversation. A conversation counter is available on each message. The unread message count is available in the top navigation bar in the badge and in the Inbox tab as shown below. The recipient label is bold for all unread messages. Read messages appear with a gray background. Click on a message subject to view full details. You can directly reply to any open message by clicking the reply button in the bottom right of the message. If there are multiple messages, you will see all messages in the detail view. Open and download message attachments. All messages with an attachment have a paperclip icon next to the subject. Click on a blue attachment link in the bottom of a message to initiate the download process from your browser. You can view the attachments from your default download location on your computer. You can reply to any message by clicking on the blue reply button. A new message window will appear for composition. You can compose a new message from the Inbox, Sent, or Trash, by clicking on the Compose button. Users with Therapists can send messages to one, multiple or all active clients, assigned to the staff member in the Client Portal. 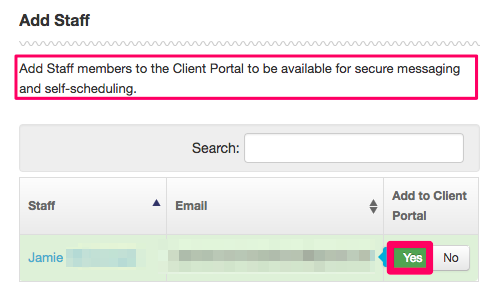 Users with Admin permissions can email all active clients in the organization. Each message will remain in the trash for 15 days before it is permanently deleted from the system. You can move messages from the trash back to the Inbox to avoid permanent deletion. Click the trash can on the right of the message. You can permanently delete a message by clicking on the Trash tab and selecting one or multiple conversations from the list and click the Permanently Delete button. You will receive confirmation when your conversation has successfully been removed from the system. Permanently deleted conversations are not retrievable. 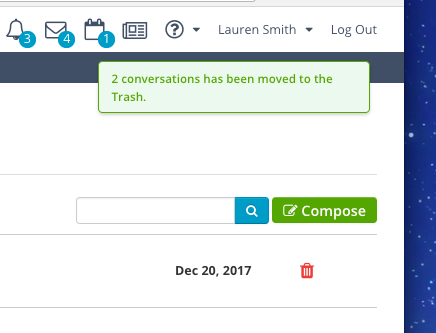 You can remove a deleted conversation from the Trash back to the Inbox by click the checkbox on the left of a single conversation or select multiple conversations and click the Move to Inbox button at the top.